It’s been a banner year for Christopher Barzak, winning both a Shirley Jackson Award for his short story collection Before and Afterlives and watching his novel, One for Sorrow, turned into a Sundance Feature Film. His work, which has been widely published in speculative fiction anthologies, as well as publications such as Asimov’s, Strange Horizons, and Apex Magazine, weaves stories of love, loss, identity, and sometimes, dancing. In “The Boy Who Grew Up,” Mr. Barzak examines a world where childhood stories turn into something fiercely magical and where the hardest decision can be simply to stay. After living in California, Michigan, and Japan, he returned to Ohio and is currently teaching fiction writing in the Northeast Ohio MFA program at Youngstown State University. In between teaching, writing, and waiting for the 2015 release of his next novel, Wonders of the Invisible World, (Knopf) he is passing along his super powers to the next generation as the faculty advisor for the student literary magazine, Jenny. To learn more about Barzak visit his website at www. christopherbarzak.com. Uncanny Magazine: “The Boy Who Grew Up,” a variation on the Peter Pan story, is not the first time you’ve visited classic tales and mythos. For example, you played with fairy tales in “Sister Twelve: Confessions of a Party Monster” (Glitter & Mayhem) and delved into the world of Edgar Allen Poe in “For the Applause of Shadows” (Where the Dark Eye Glances). What is it about these established stories and universes that call to you as a writer? Christopher Barzak: For most of my writing life, I’ve been writing original fiction, and by that I mean fiction that comes wholly from my own imagination, not someone else’s. But a couple of years ago, I reread H.G. Wells’ novella “The Invisible Man” and was surprised to find it riddled with caricatures of the working class villagers that populate most of the story. I’d read the book as a teenager and hadn’t noticed this then. But as an adult reader with years of developing critical reading skills behind me, it all felt glaring and in many ways demeaning in a cheap and unnecessary manner. One character in particular was caricatured very badly, Milly, a teenaged girl who was a sort of maid of all work in the inn where the Invisible Man stayed for several months. I felt like she deserved to be treated realistically and humanely, as most likely her life in that time and place would have been incredibly limited, and that some compassion would have been more appropriate than making her life into a farce. So I ended writing a novelette in her voice, retelling the story of the months the Invisible Man stayed in her inn, and really told her life story in the process, trying to give her back some of her dignity, hopefully. The story was published in Eclipse Online, later reprinted in Gardner Dozois’ Year’s Best Science Fiction, and went on to become a finalist for the Million Writers Award that year. It was my first conscious retelling and I was really hooked. 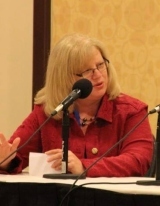 I went on from there to play around in the stories and novels of other classic genre fiction writers, to right what I thought were some wrongs in the originals, or to emphasize aspects that might have been difficult for the original writers to address in their own times and places. Uncanny Magazine: Both Colin and Peter longed to return home, not just the physical place, but also the emotional place where they felt safe and loved. In addition to home, this story delves into themes you’ve touched upon in other works such as longing, sexual identity and a return to innocence. Yet, this story feels fresh and new. Why, as a writer, do you find yourself coming back to these themes and why, as readers, do you think we’re drawn to these stories? Christopher Barzak: “The Boy Who Grew Up” is my ode to Peter Pan, who, in his original appearance (in a novel by J.M. Barrie called The Little White Bird, later reprinted as a children’s book called Peter Pan in Kensington Gardens) is quite eerie and sad and weird, and is more like a toddler than the adolescent we all know from the play and the novel that Barrie later wrote for that character. I wanted to retell this particular bit of what seems a somewhat lost narrative, buried under by the more popular renditions of Peter Pan (the play, the novel), but I also wanted to direct attention to the gay undercurrent that I’ve always found running through Barrie’s depictions of Peter Pan and his Lost Boys by making the lost boy in my story overtly gay, and dealing with a mother who has, to some extent, made him feel rejected because of being gay, the same way Peter in Peter Pan in Kensington Gardens feels rejected by his mother when he returns to the window he flew out of and finds her with a new child, already moving on from the grief of his disappearance. Dealing with rejection, especially of this kind—this core rejection of an intrinsic part of one’s self by way of sexual identity—is incredibly difficult. I think we return to stories that deal with the longing for a return to innocence, to a time before that kind of wound has been inflicted, because it is both alluring and an illusion. Peter Pan is notoriously the boy who wouldn’t grow up (and was named that as a kind of working title for the original play). I wanted to write a boy who would choose to deal with the difficulties he’s facing in the adult world he’s entered into recently, rather than one who immerses himself in the beautiful but dangerous illusions of Neverland. Uncanny Magazine: In July your short story collection, Before and Afterlives, won the 2013 Shirley Jackson Award for Best Single Author Collection. This volume comprises work from the first 10 years of your publishing career. In looking back at this collection, how do you see your progression as a writer? Christopher Barzak: In some ways, I look at those older stories and see myself doing retellings even then, but in a way that isn’t as direct as the retellings I’m doing now. I see stories like “A Mad Tea Party” (which was my first published story, in Lady Churchill’s Rosebud Wristlet) and of course there’s Alice in Wonderland overlaid on a story of domestic grief. Or my story “A Resurrection Artist” where I’ve conflated the premises of Kafka’s “A Hunger Artist” with Sylvia Plath’s poem “Lady Lazarus.” Stories like “What We Know of the Lost Families of — House” explore the tropes of so many of my favorite haunted house stories. So I guess a lot of my development as a writer has been a process of working in conversation with the authors and stories I grew up loving. So the more conscious retellings I’ve been doing in recent years, I think, are really outgrowths of that impulse to combine, to alter, or to refashion something old into something new. Instead of the materials for that being melted down and remolded in distinctly different imaginings, though, my current stories directly address the older material and work within the original shapes and forms more often than not. Uncanny Magazine: You have said that you are the type of writer who is inspired by the places he lives. You’ve also described Youngstown, Ohio, where you currently reside, as a declining town. How has this atmosphere affected your writing? Christopher Barzak: I’ve spent most of my years alive in Youngstown, Ohio, at this point. It’s where I did a lot of the writing of the stories in Before and Afterlives, and for my novel One for Sorrow, as well as for my forthcoming novel, Wonders of the Invisible World. Before moving to Youngstown to go to college, I grew up in a very rural town about forty minutes north of the city. The majority of my stories and novels are set in that rural area and in Youngstown. It’s a corner of Ohio, of America, where decline has been the overarching narrative, rather than progress and growth, largely because the industries that originated in the region fled to developing countries without labor laws in the 70s and 80s, leaving the place they made to disintegrate over time. Having grown up in that kind of narrative, my worldview is a bit different from a lot of American writers who may have grown up in say, well–off suburbs or urban centers, or even in economically healthy rural towns. Where I live, the poverty level is incredibly high (sixth highest in America in the most recent study) and because of that my writing often addresses issues of class, because my consciousness has been fashioned by seeing the differences in our American class system, which is often invisible. In England, the class system is glaringly obvious to everyone. In America, we still tend to talk as if everyone is middle class, though in recent years we’re beginning to talk a bit more about it as the middle class erodes. But even before people started to become more conscious of middle class erosion, we had a class system here, a system that benefited some and excluded others, and that has impacted my writing because of my coming from a place at the bottom of the system, a place that’s largely been ignored and forgotten. Beyond that, though, the foliage, the landscapes of places, find their way into my writing, and I enjoy rendering that aspect in language too, as a memorial to the landscapes that have nourished me as I lived there. My novel The Love We Share Without Knowing has that quality, too, though in regard to my time living in Japan. Uncanny Magazine: When releasing a piece of writing into the wild you are presenting your work to readers knowing that they are going to draw their own interpretation from your words. You recently had one of your books, One for Sorrow, made into the film Jamie Marks Is Dead. What was it like having someone else stand between your words and the audience? How did that adaptive process work? Christopher Barzak: It was incredibly cool, to be honest, though I was very happy with the film and I suppose if I hadn’t liked it, I’d be saying something else. But the director, Carter Smith, made something I really loved out of my novel. It was faithful to the spirit of the book. Though there were some changes here and there, many of the scenes were directly lifted from the novel and I love the look of the film they created. It’s moody, atmospheric, and gritty, magical and realistic. So I feel good about this adaptation, really (and love knowing how it feels to have someone else standing between my work and their retelling of it). In terms of how the adaptive process worked, the director was also the screenwriter. He developed a variety of drafts of the screenplay and at a certain point consulted me about it, wondering what I thought about it, asking me questions sometimes about a character’s motivation, etc., and I was invited to do a set visit. But I didn’t write the script itself. It was in the hands of others all along and that took some getting used to, but I trusted Carter with it because from our first conversation I could tell he really loved and got the original material. 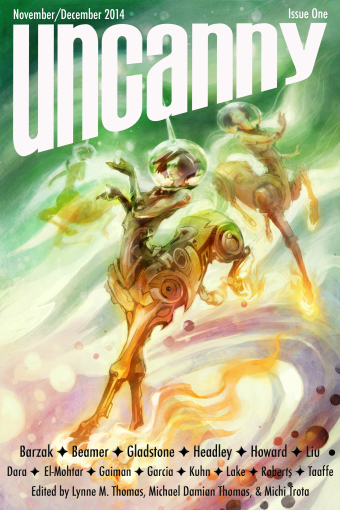 Uncanny Magazine: Thank you for sharing your fabulous story, “The Boy Who Grew Up,” and giving Uncanny Magazine readers a peek behind the curtain!